Thank you again, ladies! What a joyous event with lots of laughs, fellowship, and support for our Honduran children. We have 12 new sponsored children! If you are interested in joining our sponsorship team, the time is now! Visit the Sponsorship page for more details! Please enjoy the recipes from this years event, listed below. Combine all ingredients in a large bowl, beat with a mixer until combined. Divide dough into three sections. Flour surface and roll out to 1/8 inch thickness. Use cookie cutters and place one inch apart on a cookie sheet lined with parchment paper. Bake at 350 degrees for 11-14 minutes; watch carefully until brown on top. Cool on baking sheets or wire racks for 30 minutes. Can be frozen and rethawed. Preheat oven to 350 degrees. Spray one 9×5-inch loaf pan with floured cooking spray, or grease and flour the pan; set aside. In a large bowl, add the egg, sugars, coconut oil, sour cream, vanilla, and whisk to combine. Add the bananas and stir to incorporate. Add flour, baking powder, baking soda, optional salt, and fold with spatula or stir gently with a spoon until just combined; don’t over mix; set aside. Spread half of the batter into the prepared pan. To make the filling, combine remaining ingredients in bowl and mix to combine. Pour the filling over the bread and top with the remaining batter. Tent with foil and bake for 50 minutes or under golden and the center is set. Allow bread to cool and turn out on wire rack. Follow instructions on Duncan Heinz Milk Chocolate Chunk brownie mix box. Top with the following cream cheese icing. One box makes 60 brownie mini muffins. Combine ingredients with mixer, adding whipping cream to piping consistency. In a large stock pot, boil chicken in chicken broth until done. Take out and shred or chop chicken into bite size pieces. You may have to add more chicken broth to equal your 8 cups. You may cook your chicken in the microwave, shred and then add to your broth. It works both ways. In the stock pot, add onion, carrots, celery and olive oil. Saute 5 minutes over medium heat. Add garlic and saute 2 minutes. Add chicken, broth and dry pasta. Bring soup to a boil and simmer 15-20 minutes or until chicken and pasta are cooked. Remove from heat, add lemon juice and parsley. Serve hot. This can be frozen ahead and thawed to be used later. Flatten chicken breasts with heavy pan or flat size of meat tenderizer. Combine cheeses and sun dried tomatoes and spread over chicken. Roll chicken and wrap with bacon. Work bacon around all sides width wise, and then length wise. Bake at 400 degrees for 30-35 minutes; broil for 1-2 minutes at the end to crisp the bacon. Combine all dressing ingredients in a large mason jar. Whisk or shake vigorously. Pour dressing over salad greens. Top with berries and pecans. Preheat oven to 375 degrees; line baking sheets with parchment paper. Cream butter and sugars. Add vanilla and eggs until combined. Mix in flour, baking soda, and salt. Add chocolate chips, stir only until combined. Use an ice cream scoop or 1/4 measuring cup to scoop dough; roll in hands to form balls and place on baking sheet several inches apart. Cook 16-18 minutes, until golden on top (keep an eye on them). Cream shortening and sugar. Add eggs, one a time. Add molasses. Sift flour with salt, baking soda, cinnamon, and ginger. Add slowly to wet mixture until well blended. Doug will be stiff; chill in refrigerator for 2 hours. Scoop with ice cream scoop, roll, and flatten with hand on parchment-lined baking sheet. Sprinkle tops with granulated sugar. Bake at 350 degrees 11-12 minutes, or until lightly brown. Do not over bake. On March 3rd, the doors opened to another fantastic time for the ladies of our community and the surrounding areas. The theme was “Let your light so shine, that others may see your good works and glorify your Father which is in heaven” Matt 5:16. Thank you to our Guest Speaker Chris Adams of Hendersonville, TN. The Ladies Luncheon was above and beyond our expectations! Thank you so much to all who gave of their time and talents to make our biggest fundraiser so successful! This year’s luncheon featured a wedding fit for the King! Participants were sincerely and humbly addressed my Mrs. Karen Alexander-Doyel, what a blessing! Cookie Project embraces the luncheon each year as our greatest fellowship and fundraising event. Proceeds from this year’s event were over $12,000. The children and families will continue to be served and blessed by the outpouring of service and donations. May God bless each of those who cooked, cleaned, set up, decorated, attended, and gave. Preheat oven to 350 F. Place 8 slices of baguette on the baking pan and bake for 10 – 15 minutes. Remove from oven and cool off a little. Whip cream cheese and honey together; spread mixture on each baguette slice. Add diced strawberries on top. Preheat oven to 375°. Beat butter and sugars at medium speed with an electric mixer until creamy. Add egg and vanilla, beating well. Lightly spoon flour into dry measuring cups, and level with a knife. Combine flour baking soda, salt, and cinnamon in a bowl, stirring well. Add oats; stir well. Add to butter mixture; stir until well blended. Drop by rounded tablespoons 2 inches apart onto baking sheets lined with parchment paper. Bake at 375°for 10 minutes. Cool on pan 2 to 3 minutes. Remove cookies from pan; cool on wire racks. Spread one tablespoon of cream filling over each bottom side of half of cookies; top with remaining cookies, right side up. Combine ingredients in a medium bowl. Beat with an electric mixer on low speed until combined, scraping bowl. Beat on high until light and fluffy. In a medium bowl, combine cream cheese, pecans, pepper, and onion. Cover and refrigerate to blend flavors. Remove from refrigerator and return to room temperature. Spread on bread and cut into sandwiches. Wash and drain broccoli. Trim the flowerets into tiny pieces and place in a large bowl. Add bacon, onion, grapes, pecans, and cheese. In a small bowl combine mayonnaise, vinegar, and sugar; mix well. Add to broccoli mixture and toss well. Preheat the oven to 400°F. In a small sauce pan, melt the butter. Add the garlic, parsley, and honey. Spread carrots on baking sheet lined with parchment paper. Pour mixture over carrots. Season with a large pinch of salt and black pepper. Toss well. Spread out in a single even layer, and roast for about 20 minutes, or until the carrot is fork-tender and lightly browned. 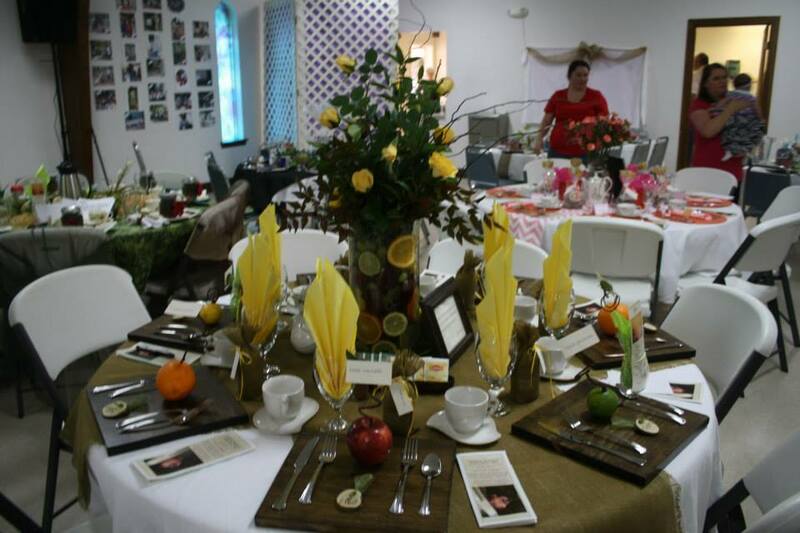 The 5th Annual Ladies Luncheon and Tea was held on Saturday, March 7th, 2015 at Slaughter Baptist Church. The theme for this year’s luncheon was “Built to Serve” and the focus was to raise money for the building of a wall and facility on the land recently purchased by the project. With all of the generous donations, tips for men servers, and silent auction proceeds the total profit was just under $12,000. Praise the Lord! We sincerely thank each of you that participated in making this event a success, for it would not be possible without the support of the area churches and individuals that support CPH. Preheat the oven to 400° F and follow the directions on box to thaw the puff pastry. Trim off the wax coating on the Brie cheese and cut in half. Place the cheese on the center of the pastry and trim to the desired shape, keeping one side large enough to fold over the top of the cheese. Spread apricot preserves on top of the cheese and fold pastry over. Separate the eggs and beat each separately. Brush the edges of the puff pastry with egg whites and press the edges of the pastry with a fork. If pastry dough is used for decorations on top, use egg whites to help stick dough together. Brush the top of the finished product with the egg yolks for a nice brown, glossy finish. Bake for 15 minutes or to light golden brown. Preheat the oven to 350° F and generously grease 12 regular muffin cups or 24 mini muffin cups. Mix the ingredients together reserving one pecan for the top of each muffin. Fill muffin cups 2/3 full and top with reserved pecans. Bake for 15 minutes or golden on top. Core the lettuce, rinse, and drain upside down on a towel. Pat dry and cut into 6 wedges. To make the dressing, whisk together the mayonnaise, sour cream, buttermilk, Worcestershire sauce, vinegar, salt, black pepper, and cayenne pepper. Drizzle dressing over each wedge and top with tomatoes and bacon. Peel the apples and cut into tiny chunks. Place apples in orange juice, drain, and then refrigerate. Soak the dried mixed berries and raisins in orange juice for 2 hours, then drain. In a 2-quart pot, add all of the ingredients and cook on medium heat until the berries are plump. Preheat oven to 350° F Cook spinach according to package instructions; drain and reserve liquid. Melt the butter in a saucepan, then sauté the onion and garlic. Add flour, stirring until smooth, but not brown. Add the reserved liquid, stirring constantly. Cook until thick. Add vegetable liquor, black pepper, celery salt, Velveeta cheese, Worcestershire sauce, and red pepper. Stir until the cheese melts. Add the spinach and heat through. Pour into a casserole dish and top with buttered bread crumbs. Bake in oven till warm and bubbly, about 30 minutes. Preheat oven to 350° F. Whisk cake mix and pudding mix in large bowl. In a separate bowl, combine the sour cream, eggs, water, and coconut oil. Add wet ingredients into large bowl and mix until combined. Fold in chocolate chips. Fill mini Bundt cups 2/3 full and bake for approximately 18 minutes, or bake 45 minutes in a regular Bundt pan. Top with icing, recipe follows. Cream cheese and butter together. Add powdered sugar, mix until smooth. Stir in vanilla. Preheat oven to 350° F. Whisk cake mix and pudding mix in large bowl. In a separate bowl, combine the sour cream, eggs, water, and coconut oil. Add wet ingredients into large bowl and mix until combined. Fold in chocolate chips. Fill mini Bundt cups with ¼ cup of batter. Dollop 1 teaspoon of raspberry pie filling on top, then swirl with a knife. Top with ½ cup of batter, or until mini Bundt cups are 2/3 full. Bake for approximately 18 minutes, or bake 45 minutes in a regular Bundt pan. Top with icing, recipe follows.